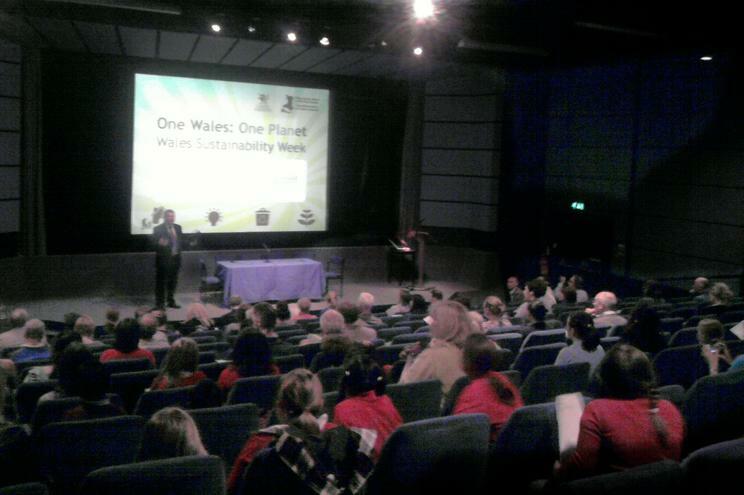 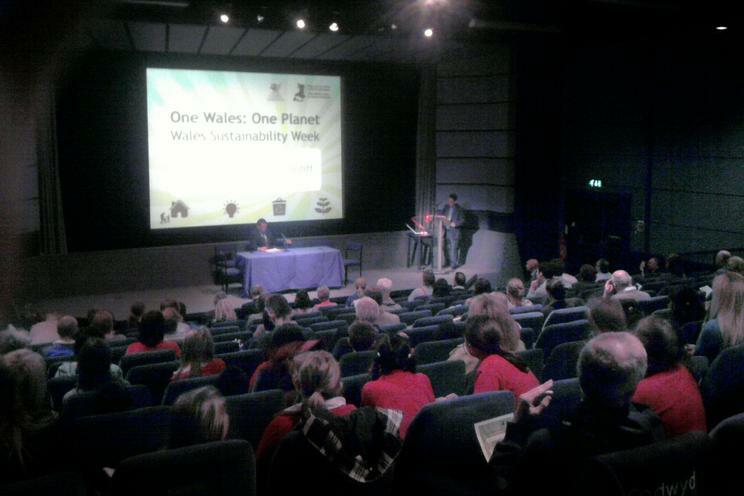 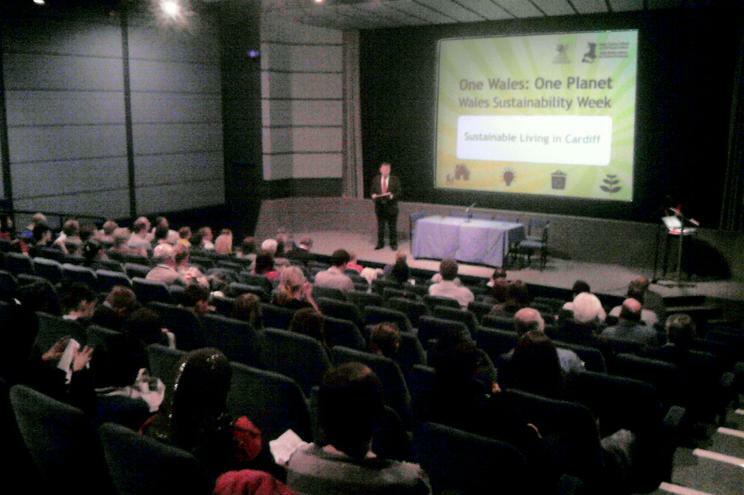 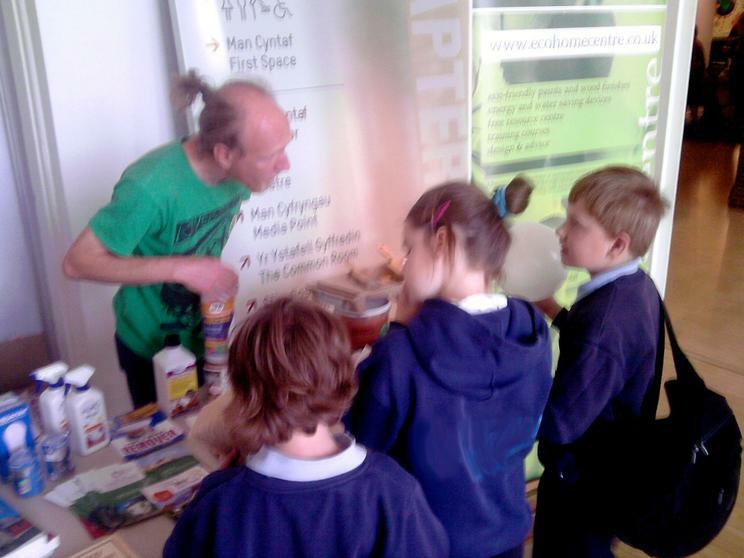 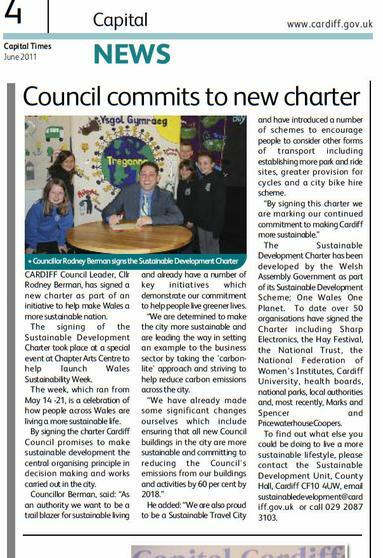 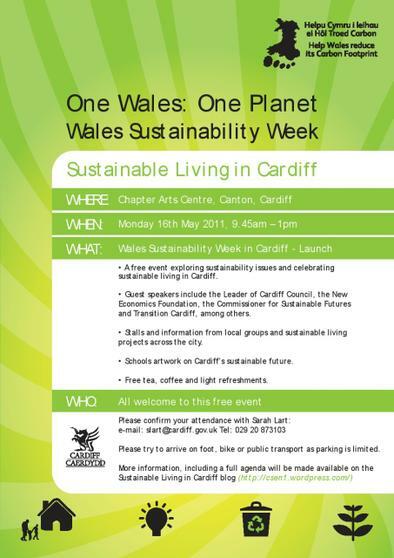 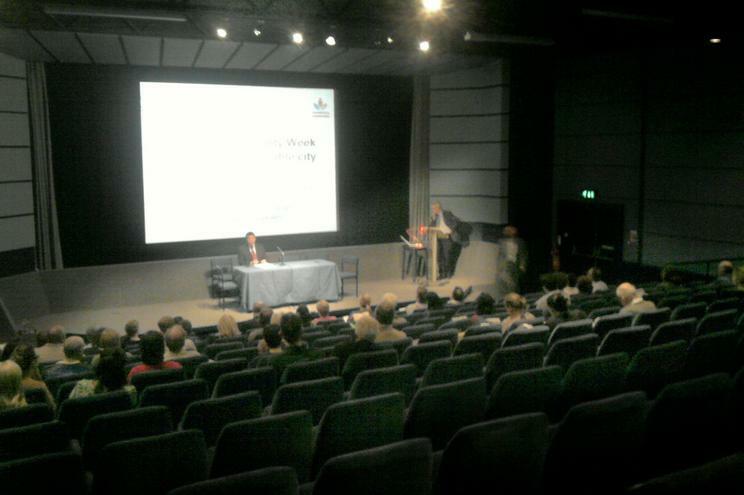 Monday 16th May was the start of the second Wales Sustainability Week. 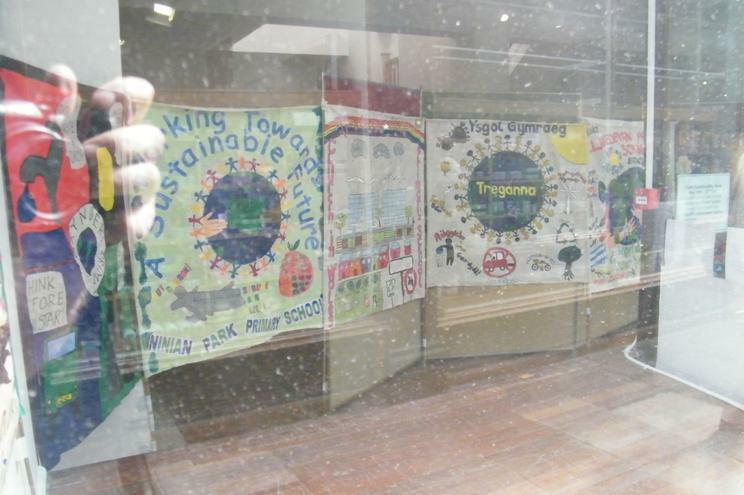 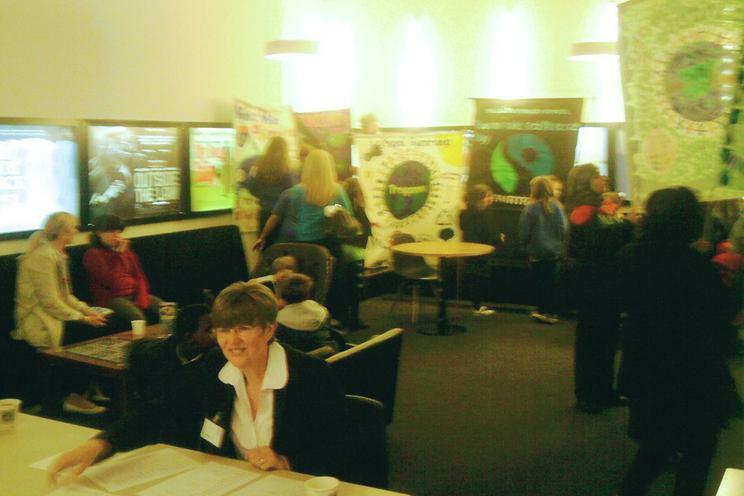 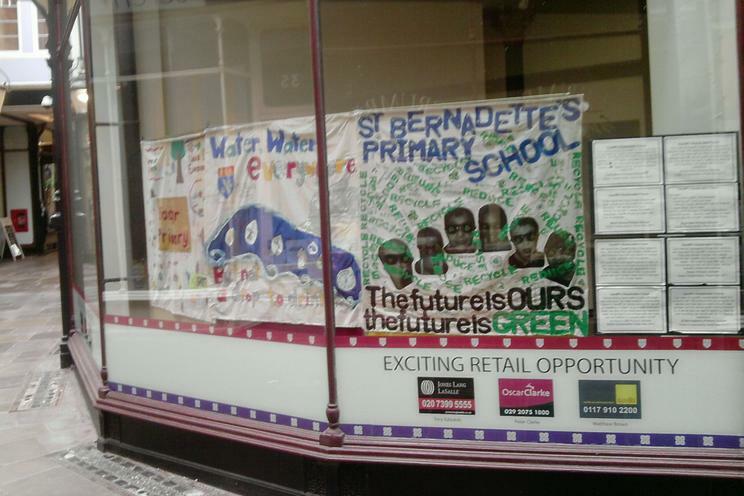 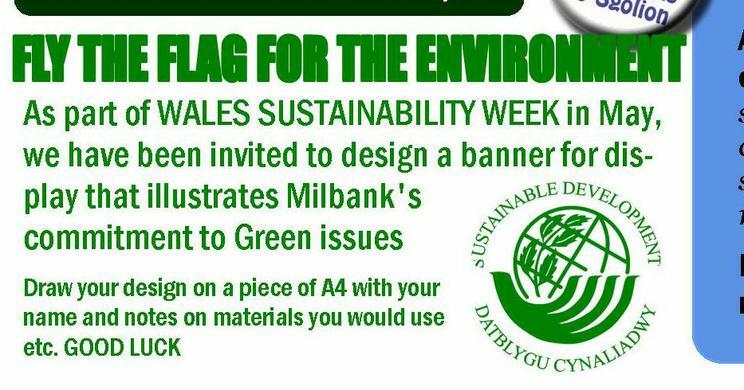 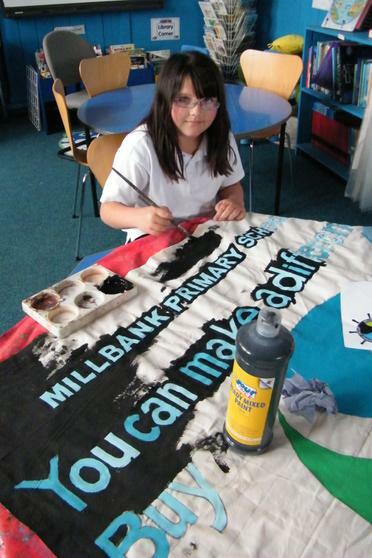 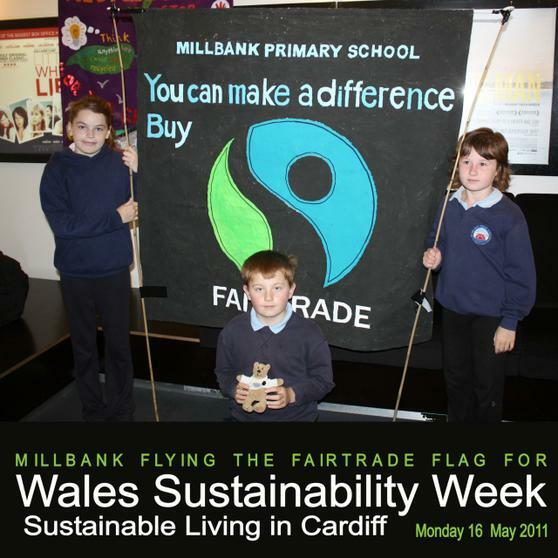 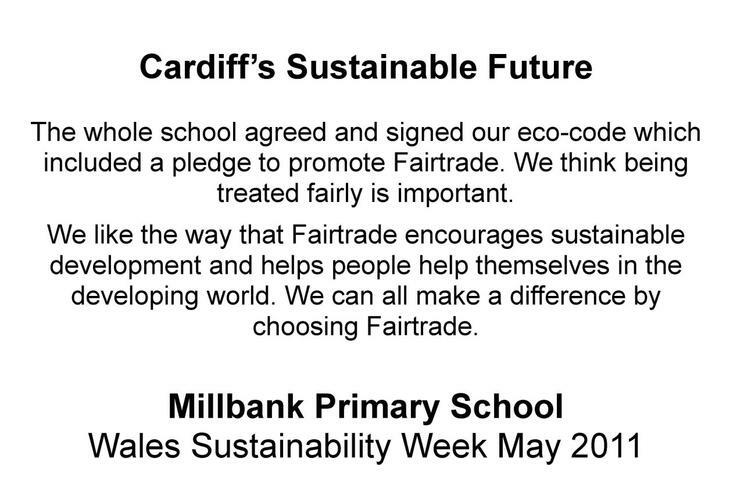 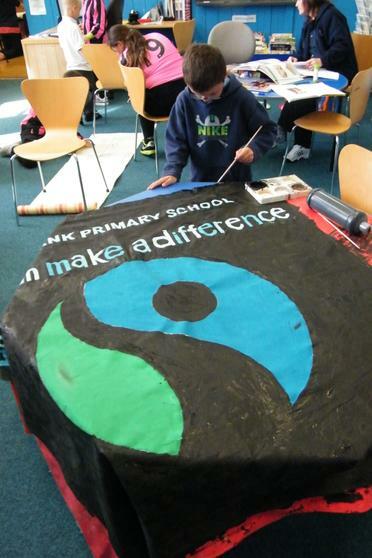 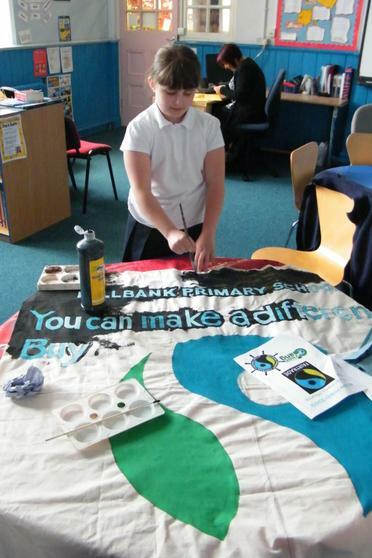 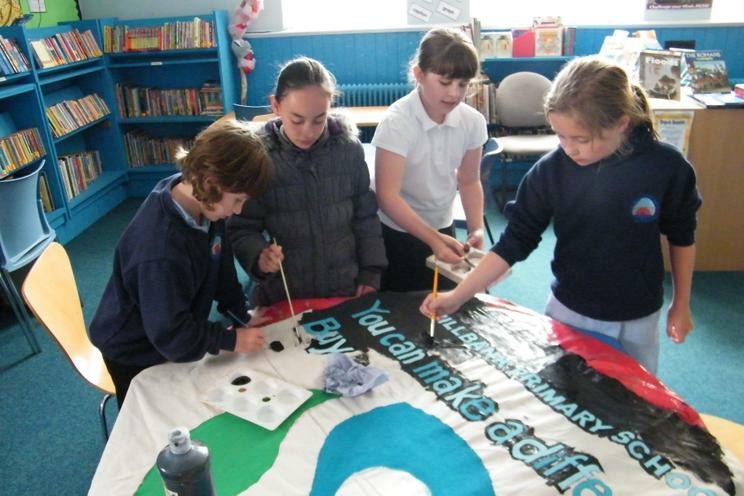 All primary schools in Cardiff had been invited to attend the event and demonstrate their commitment to sustainability by making a banner. 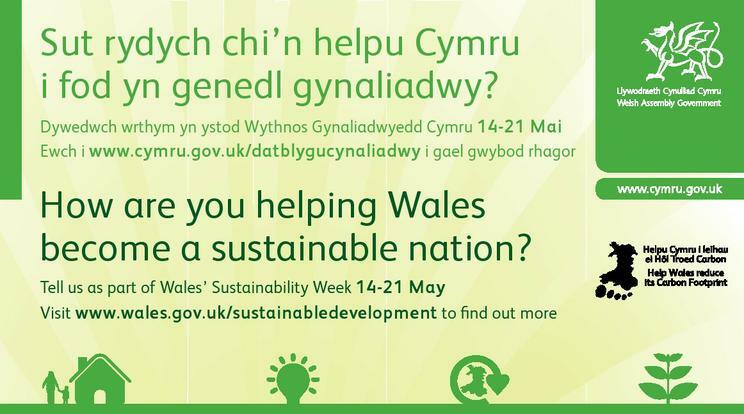 The simple definition of Sustainability is '..meeting our needs today without compromising the ability of future generations to meet their own needs.' 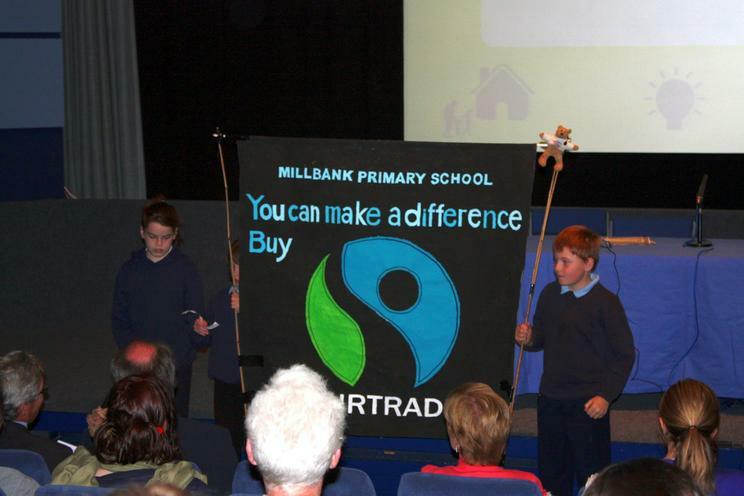 was great but the UN soon found that it was too simple and the new 3 legged stool version includes a lot of the very different issues needed to be balanced to achieve sustainability. 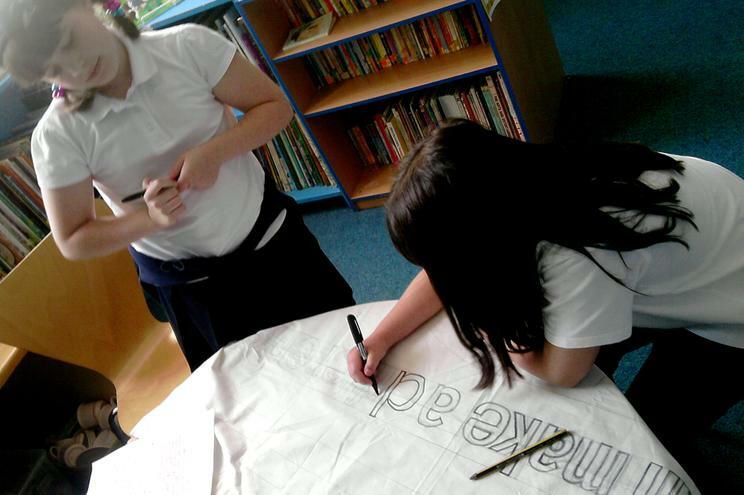 Erin did not want the banner to be too messy and said "Keep it simple!" 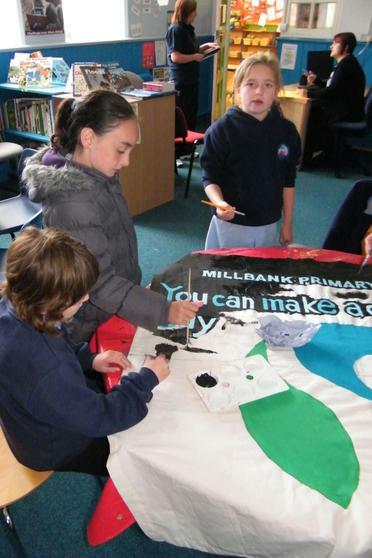 Sherraya pointed out that we could do a new banner every year on a different aspect or theme and they could be displayed together in the Hall. 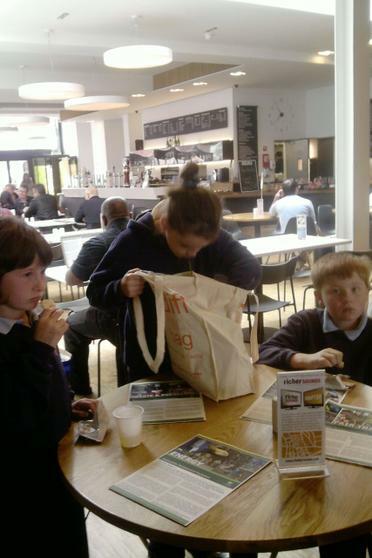 They are a clever lot! 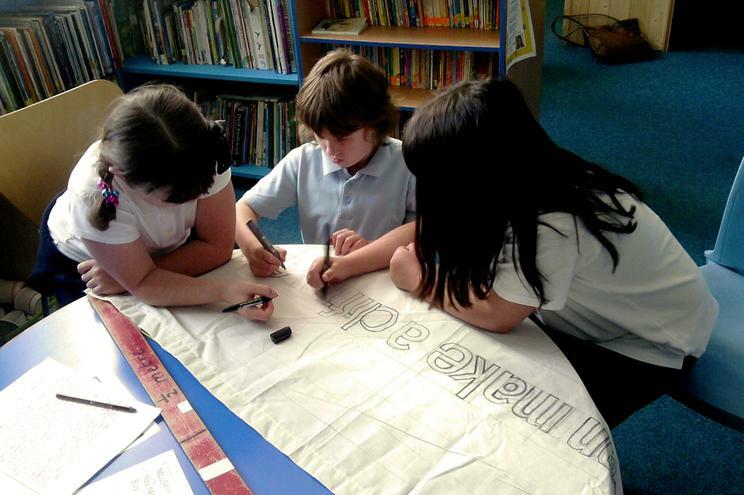 We used the suggestions to draw up three simple banners which we went back to the school to vote on. 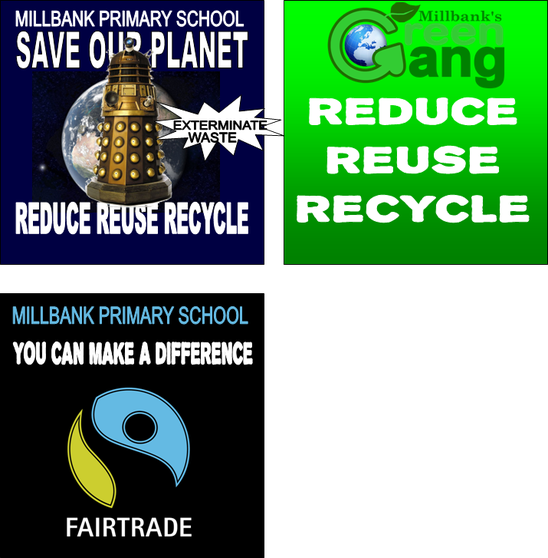 The staff and volunteers thought that the Dalek one would be the winner and fit in with the recycled Dalek compost bin. 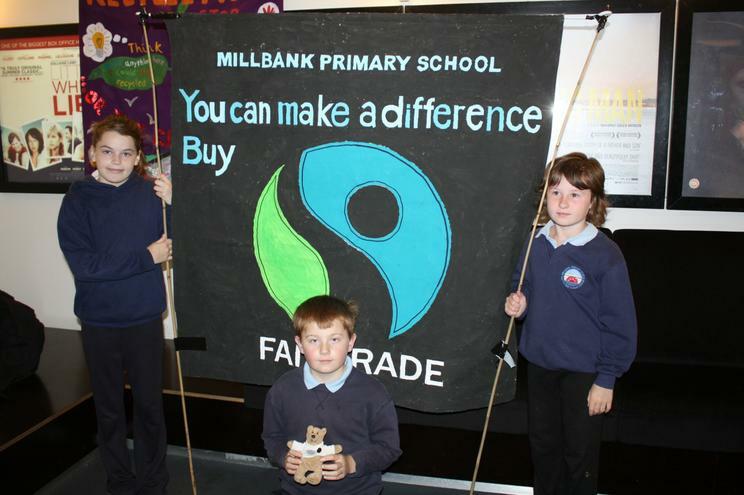 But all that work and commitment to Fairtrade had had a deeper affect than we thought and that was the one the children decided to take forward. 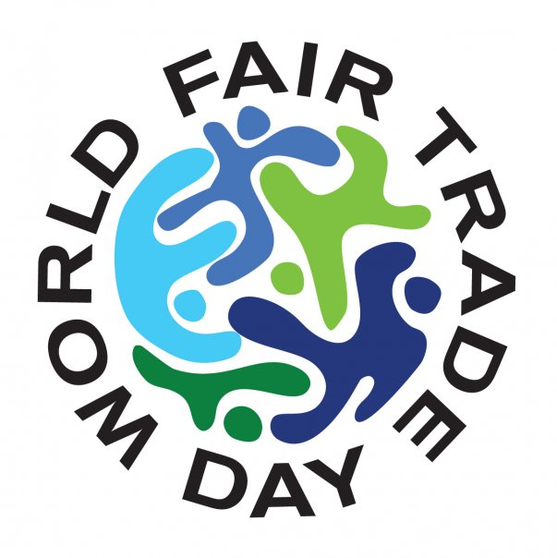 Fairtrade is about sustainability and all the many issues around that and it tied in nicely with the World Fairtrade day on Saturday 14th May. 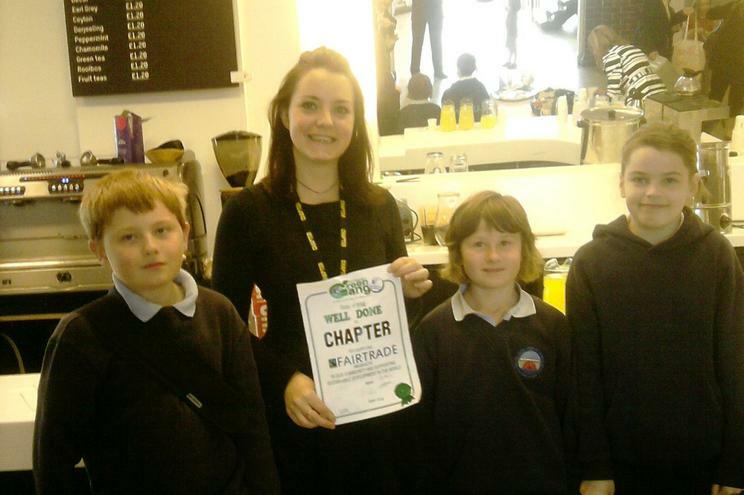 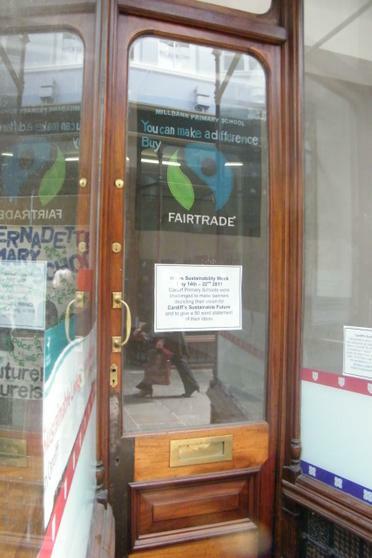 The venue -Chapter Arts- is well known as a fairtrade cafe. 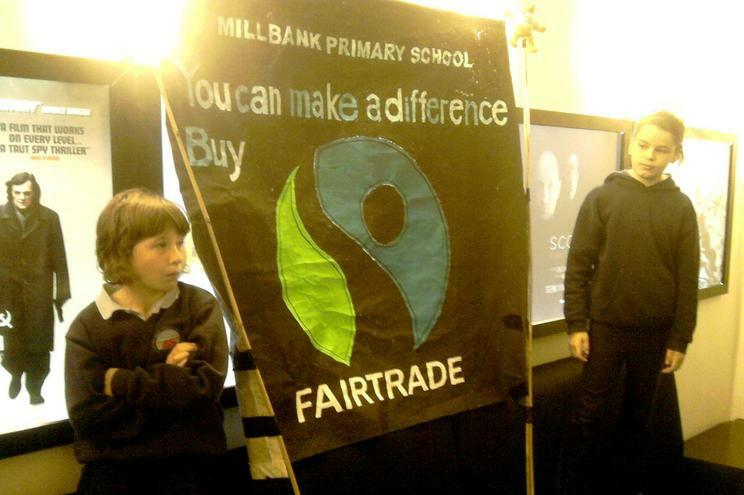 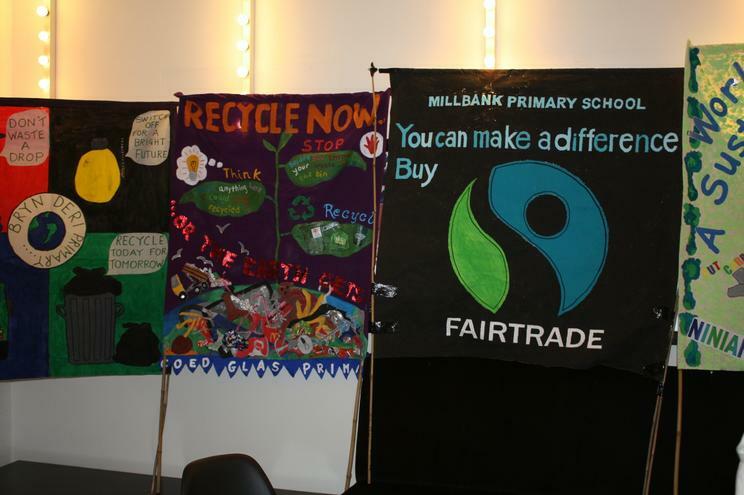 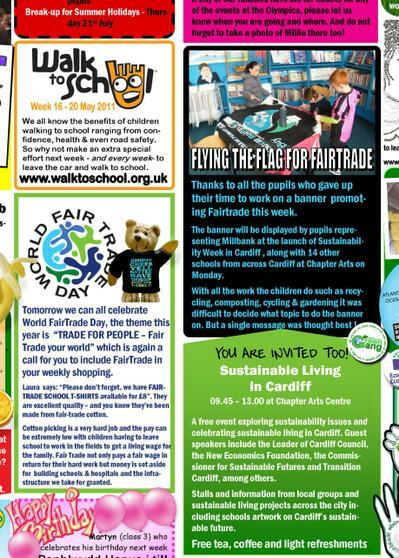 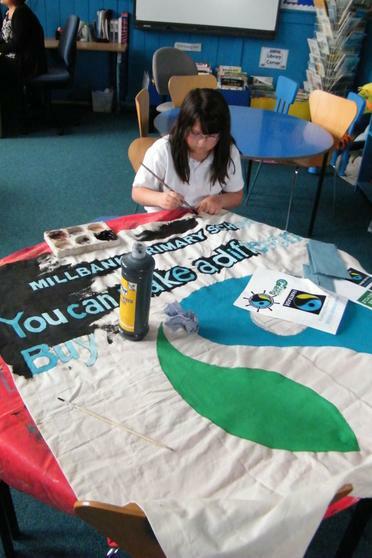 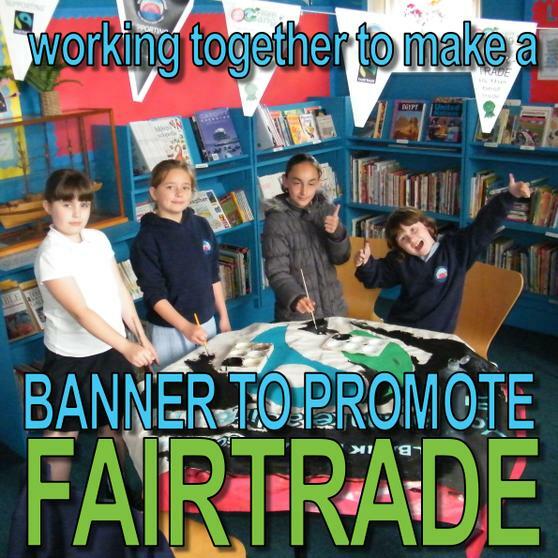 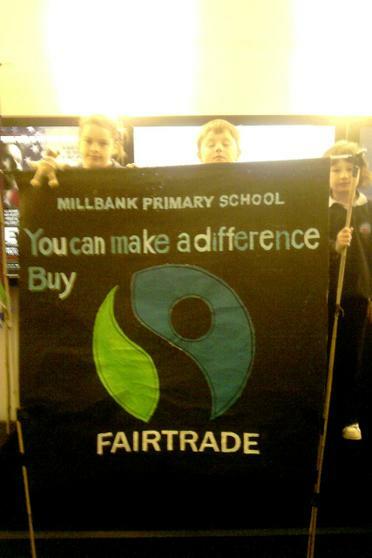 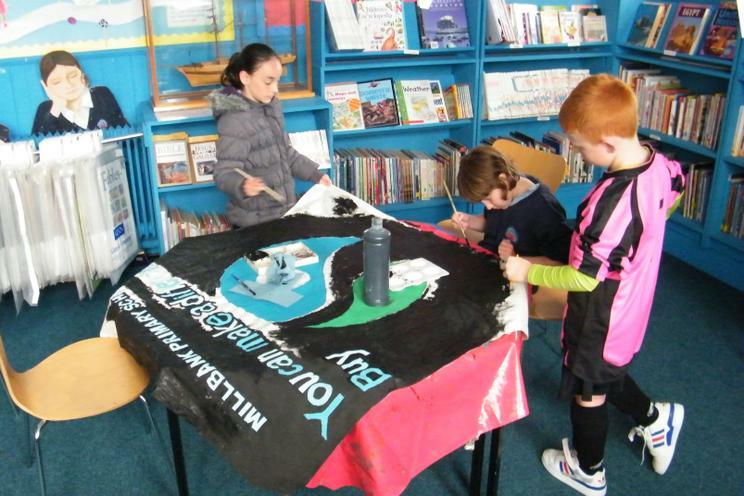 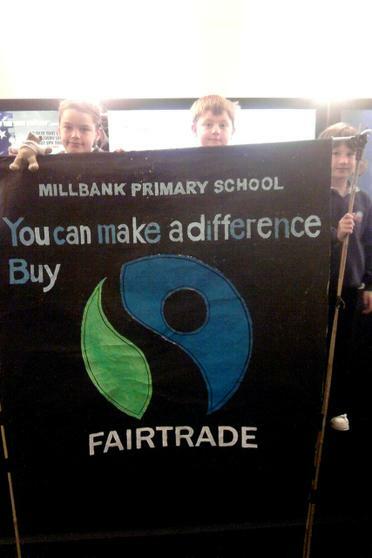 We could also reuse the banner on Green Britain Day and any FairTrade event in the future. 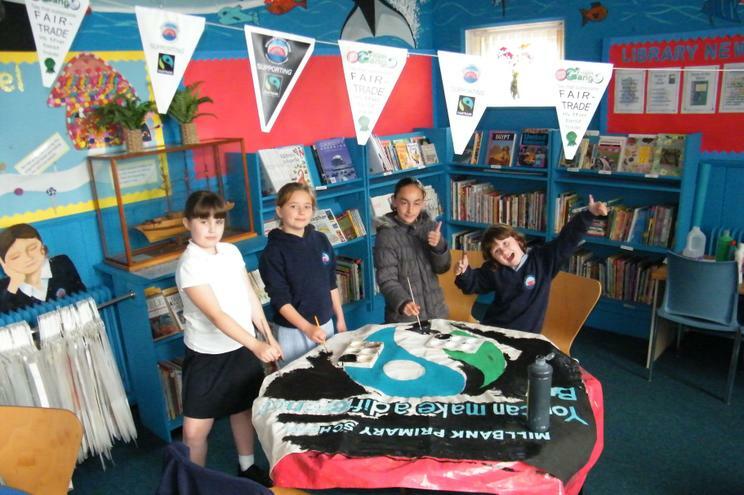 Whilst Green Gang is the official club that deals with environmental issues, as with most of their work anyone and everyone seemed to have a go which was really nice. 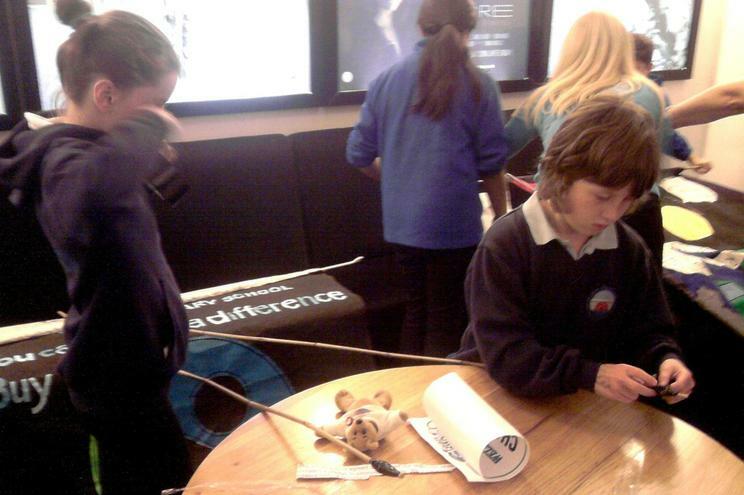 Children gave up their own time to help, and did as little or as much as they felt they needed. 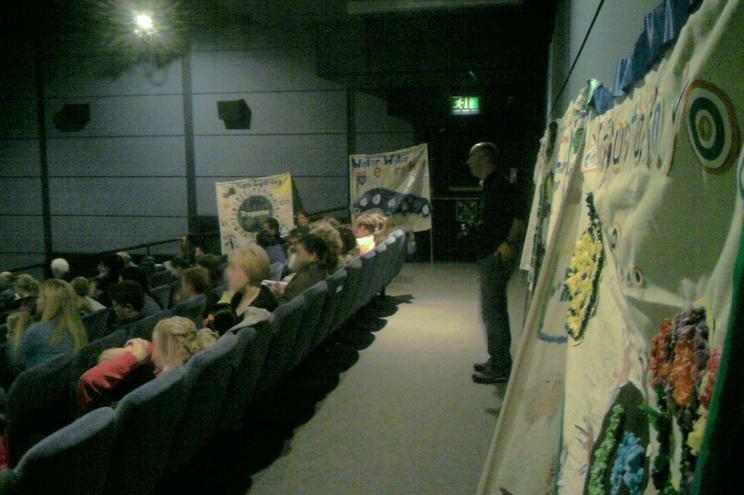 A volunteer took 3 pupils and their finished banner down to the venue to meet up with the other schools. 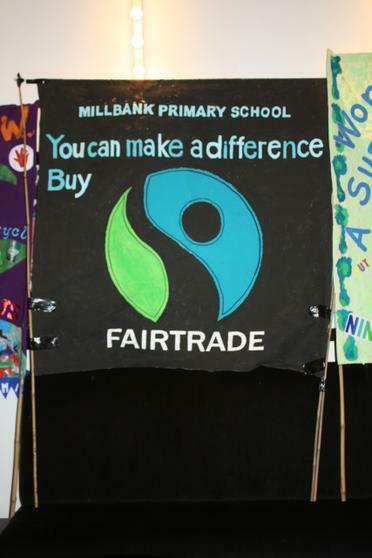 We saw lots of people that we knew such as Jan from the Fairtrade shop, Tim from the Bike It school scheme and the guest speaker was Mr Peter Davies the Commissioner for Sustainable Development. 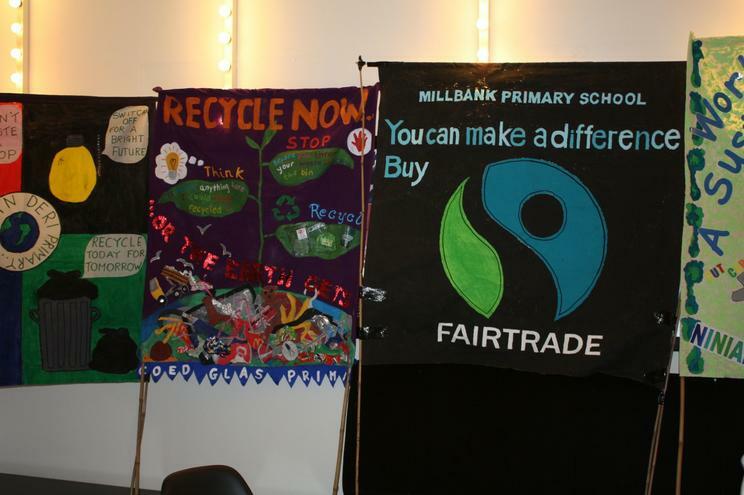 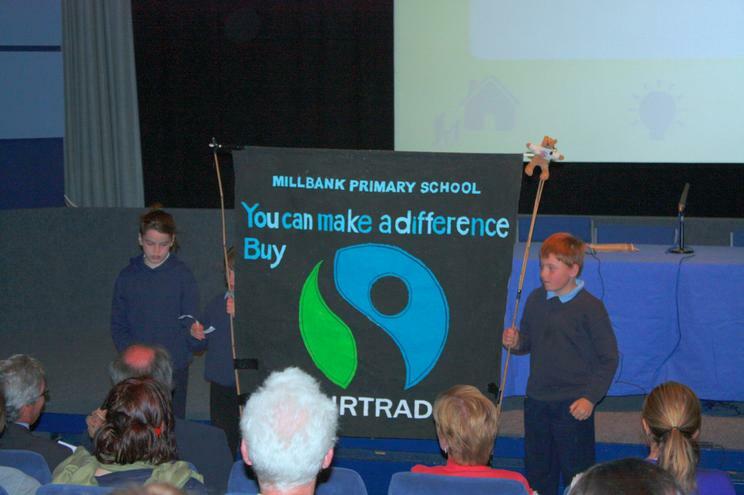 The schools took it in turn to parade their banners in front of the guests and read out a short summary then they went back into the hall for some orange squash and Fairtrade biscuits! 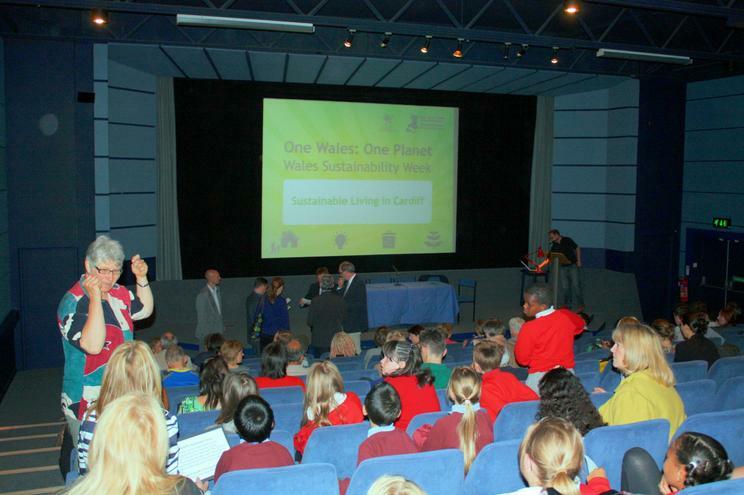 Last year the Minister for the Environment and Sustainability came in to answer some of our questions as part of the First Welsh Sustainability Week celebrations. 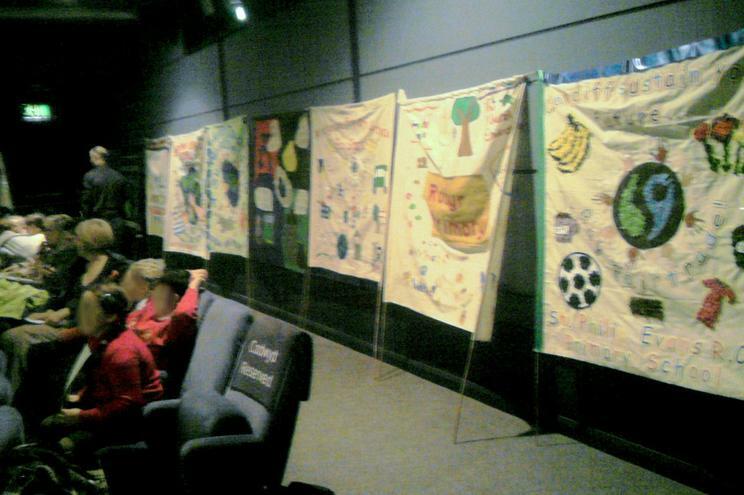 After the children had presented the banners they could look around at the stalls. 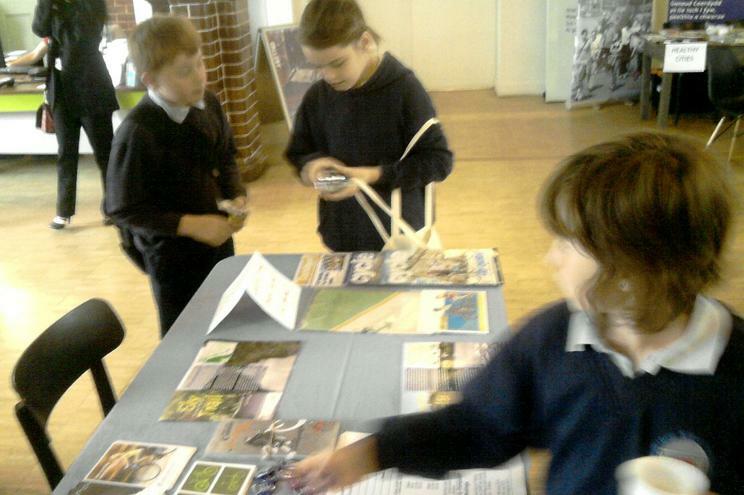 They got lots of pencils and pencils and tape measures and badges. 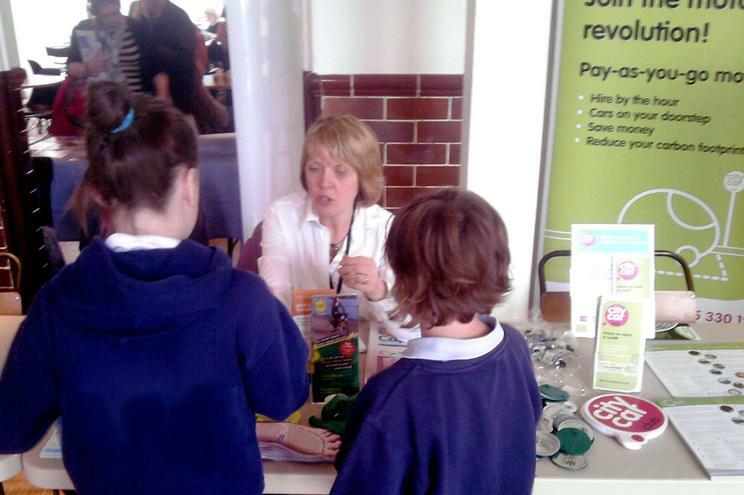 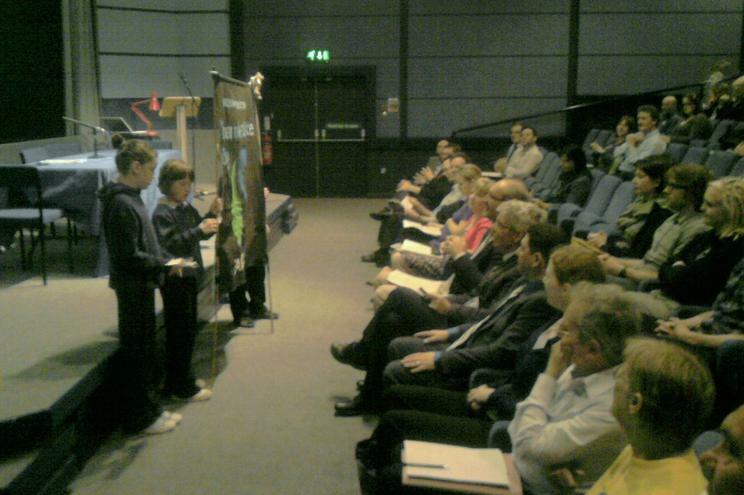 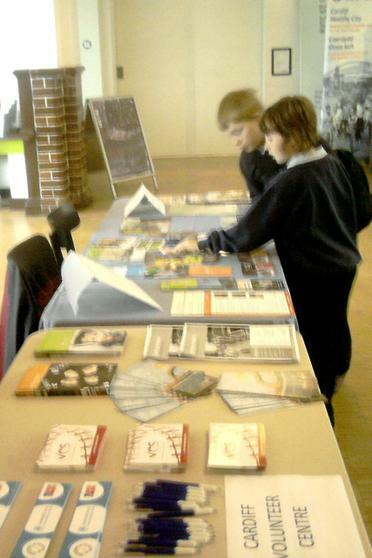 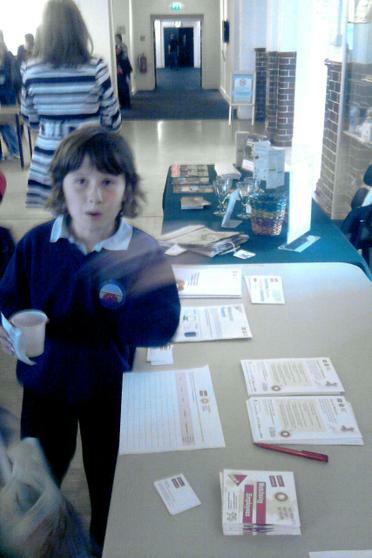 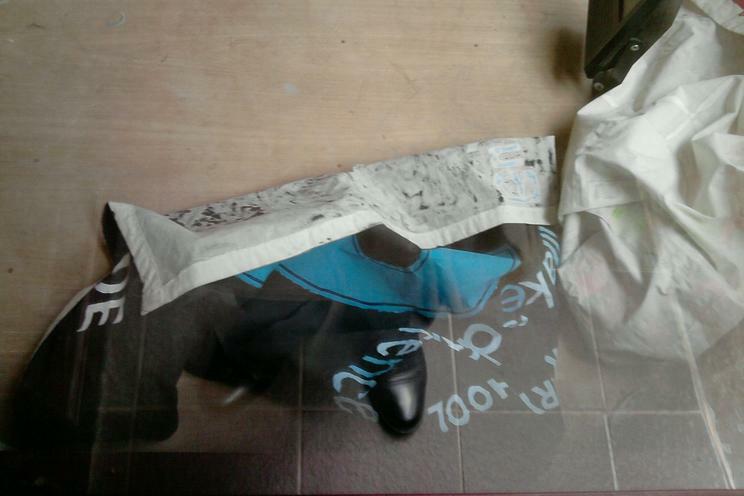 But they also looked at what leaflets that they could use at the GREEN BRITAIN DAY event at the school two days later. 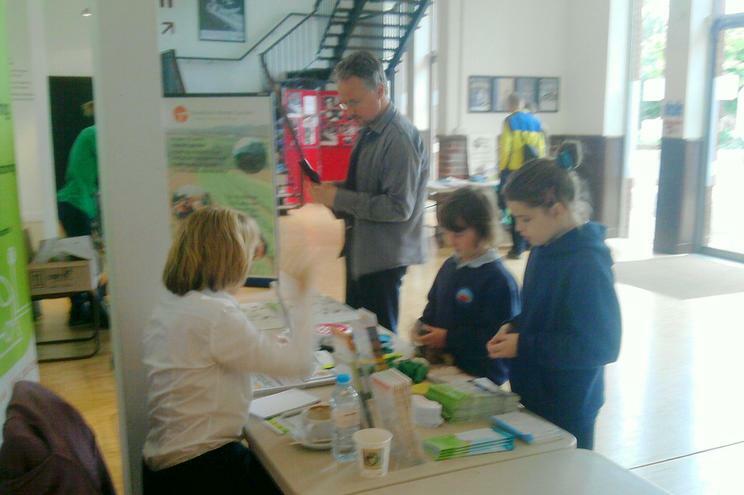 Lots of parents came along to that so it was nice to see the information was made available to them. 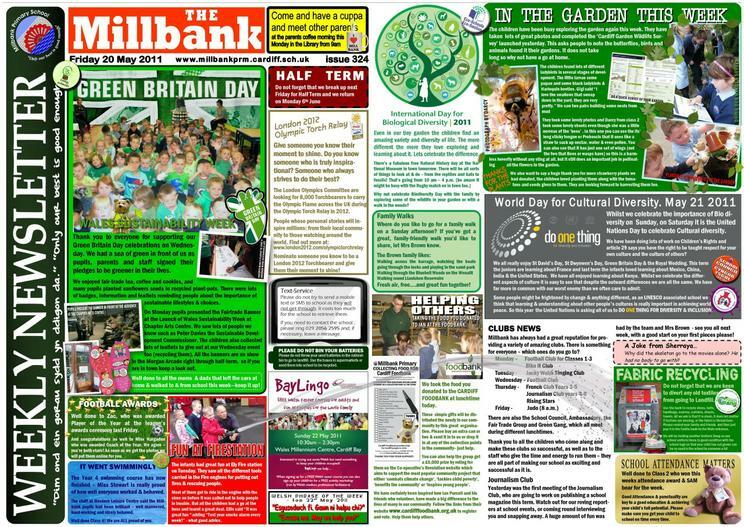 We do try and keep parents informed about what is going on at Millbank and the wider community in our weekly parents newsletter. 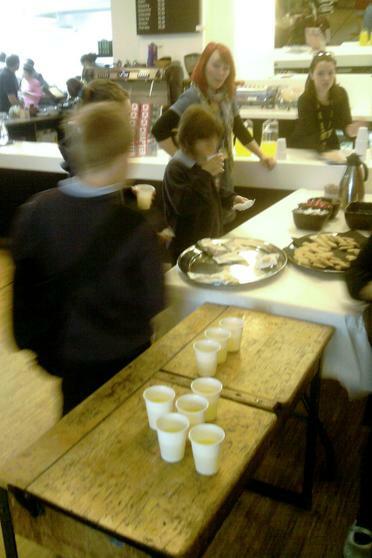 We even mentioned the Launch and invited them to come along too. 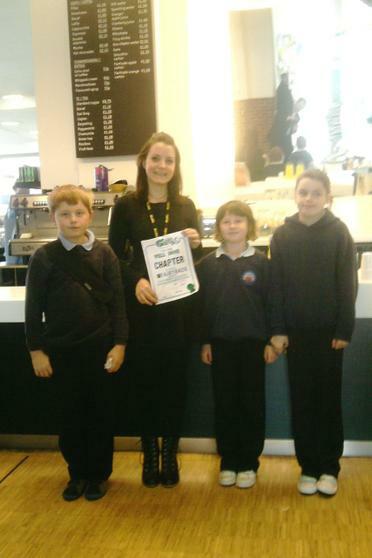 The children in Green Gang always try and add some eco- tips or run competitions in the community. 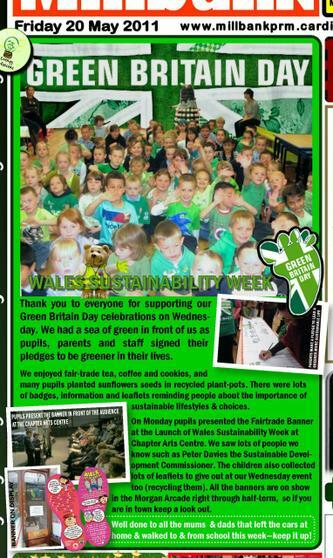 We even managed to do a special community edition to mark the 300th newsletter, which included lots of recycling tips and information too which we delivered to local homes over a few lunchtimes. 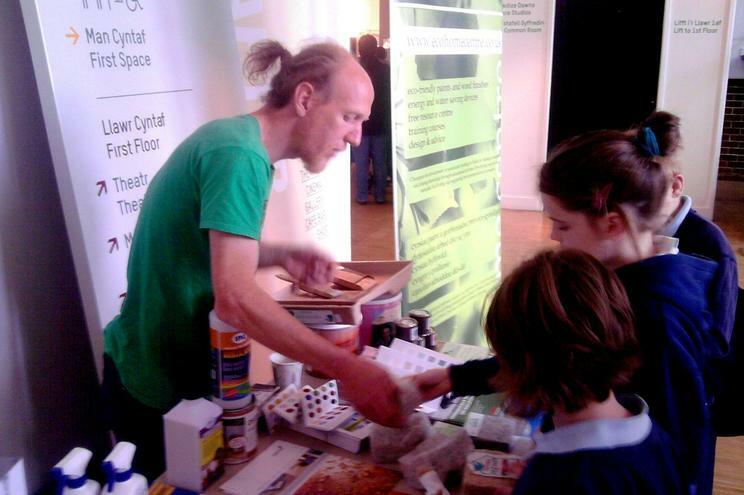 We are always after new ideas or partners to work with so if you do have any ideas please let us know! 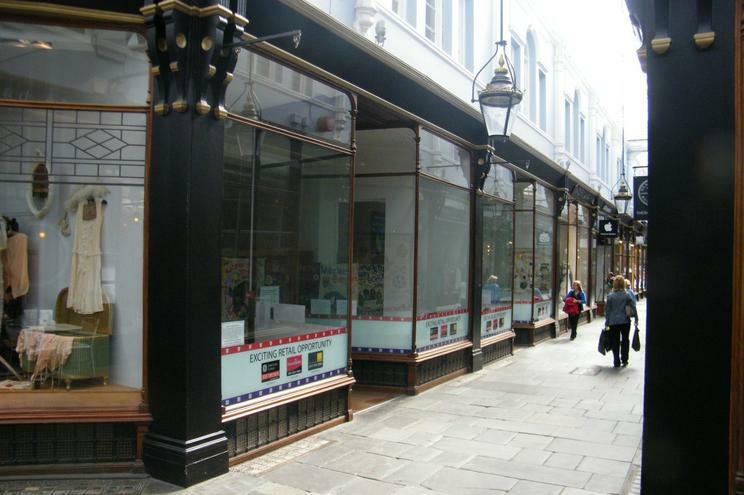 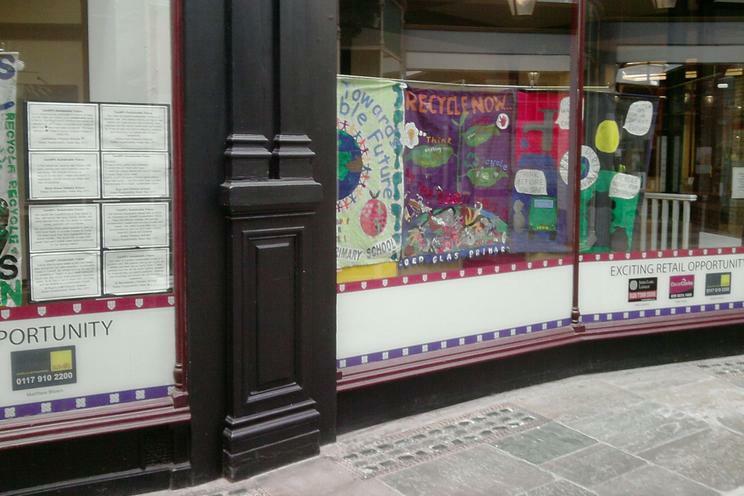 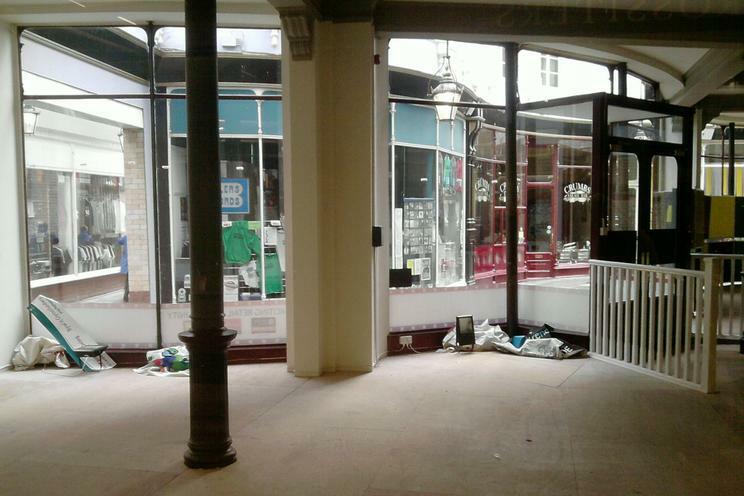 All the banners were put on display in a vacant shop in David Morgans Arcade over the Easter Holidays. 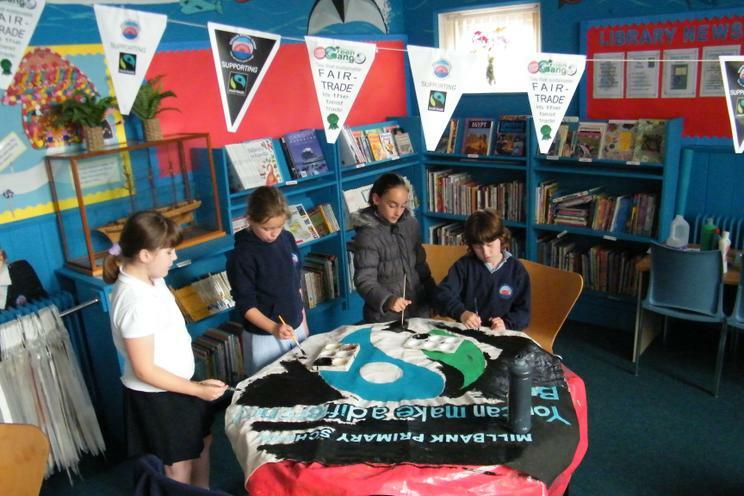 We believe that teaching the children about environment issues not only will make them more responsible citizens but will better enable them to fully engage in the growing environmental industries and important employment opportunities for the future.